Whole Foods, whole paycheck: You've probably heard that comparison before, right? 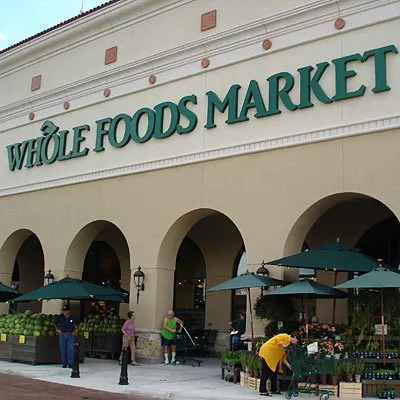 Whole Foods is known for their wonderful selection of high-quality health foods, but also their steep prices. However, if you know what to look for, you can find some great deals on groceries. Whole Foods, whole paycheck: You've probably heard that comparison before, right? Whole Foods is known for their wonderful selection of high-quality health foods, but also their steep prices. However, if you know what to look for, you can find some great deals on groceries. That said, here are six of my favorite Whole Foods finds that won't break the bank! Freshly ground almond butter - $6.99/pound: I love almond butter, so I often buy the freshly ground stuff from Whole Foods. It's thick, rich, and flavorful (you grind it right there) and quite a bit cheaper than other almond butters on the market, which typically retail for $8.99 to $10.99 per pound. Basically, for what you get, the freshly ground almond butter at Whole Foods is an amazing deal! 365 Honey Almond Flax Protein & Fiber Crunch - $3.29: Boxed cereal, especially the healthy kind, is expensive, right? This box of 365 Honey Almond Flax Protein & Fiber Crunch is nutritious, delicious, and wallet-friendly. For a little more than $3 per box, this slightly sweet, fiber-rich, and protein-packed (there's 9g of protein per serving) cereal is worth every penny. 365 Goat Cheese (11 oz ) - $5.99: This goat cheese is an awesome product and a great value. It's incredible fresh and creamy and makes a delicious addition to a salad, spread on crackers or topped on warm, creamy soup. Be sure to pick up this product on your next trip to Whole Foods! 365 Thin Crust Frozen Pizza - $3.99: At just $3.99 per pizza, the 365 Thin Crust Frozen Pizza is an awesome budget find. Made with wholesome ingredients (none of that fake stuff), these frozen pizzas are healthier, cheaper, and portion-friendly compared with traditional delivery or take-out pizza. 365 Organic Marinara Sauce - $2.29: The 365 Organic Marinara Sauce comes in a variety of different flavors (Italian herb, mushroom, eggplant, four cheese, and tomato basil), so it's incredibly versatile and can be used in all kinds of recipes. The 25-ounce jar is a great value at just $2.29.